When someone lends some amount to another person or entity, the lender expects to get repaid after some certain period. The borrower is liable to pay back the lent amount along with the interest gathered during the loan period. But the lender also wants to secure the loss due to unpaid lent amount. To secure the amount lender seeks some assurance from the borrower. This is nothing but collateral securities. 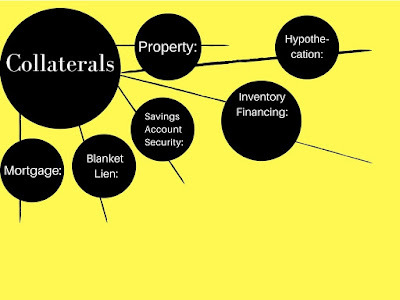 Collateral is an object or asset that a borrower offers to the lender at the time of lending to secure the borrowing. This is offered so that the lender can have the security of the lent amount. If the borrower cannot able to make repayment of the debt, the lender needs some sort of asset to compensate his losses. For that lender keeps some asset or property from the borrower, by selling them lender can get his amount back & compensate his losses. Collaterals should be tradable product or property. These are kind of risk reducer of the loan. Collaterals are kept in various types to make the reply feasible & simple. Now here are some types of collaterals kept with the lenders. While applying for a loan a borrower keeps his property as offered collateral. The lender keeps the property papers. House, car, land & so on can be the offered collateral. If the borrower is unable to repay his lent amount, the lender can capture the property offered by the borrower legally. Basically, the property becomes the default for the loan. On the loan for business inventory financing is one of the most popular collaterals. When a borrower takes a loan to sell some product for his business he keeps the product as a default. Here on the failure of repayment, the lender takes away the product to be sold. This kind of collaterals is not very secure for the lender. When a borrower leads from a home branch his savings account becomes his collateral. If the borrower is unable to repay his debt the lender bank can seize his account deposits. The lender can use the liquidity of the account. As the liquidity is related the lender is more secure in this case. Lien is a legal procedure to claim the loan amount by the lender. The blanket lien is especially for business loans. In these cases, the lender has the legal protection to claim his loss due to a default. Here the lender can sell all sorts of business property to get his debt back. In this type of collateral, the borrower is not in the secured bracket. These kinds of collaterals are offered mostly for the home loans. Here the property built with loan becomes collaterals. On failure of repayment of the loans, the lender becomes the owner of the property & can sell that to make up for his losses. In mortgage collaterals borrower is more secure than the lender. In transport services, the vehicle owner needs the loan for his vehicle. He takes loan offering the vehicle as collateral. In the event of default, the lender captures the vehicle to secure his losses. On hypothecation, the lender is always unsecured.